The fervor continues to grow for Star Wars: The Force Awakens as the premiere date approaches, and now Funny Or Die has a peek behind the scenes of the famed franchise. 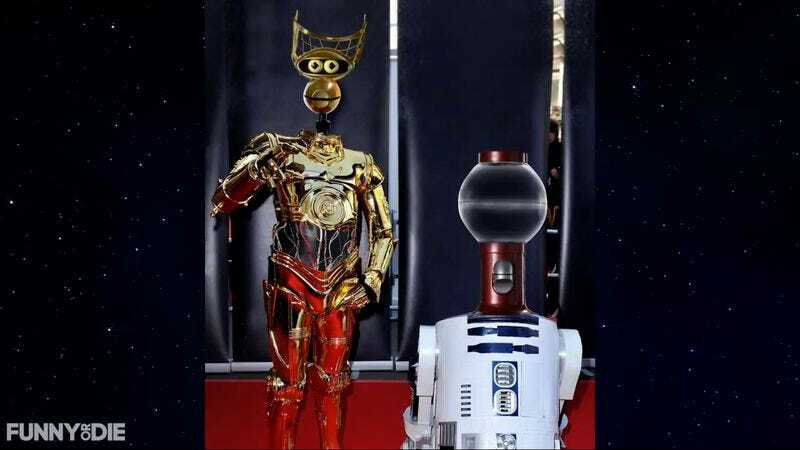 In the clip below, Tom Servo and Crow T. Robot audition to be the new droids in the latest Star Wars offering and viewers can see exactly how they fare in their attempts to copy the beep-boops needed to be a lovable droid in a galaxy far, far away. Of more interest is that this is the first real glimpse fans are getting of the new voices the ’bots will have in the new Kickstarted version of the show. As previously announced, comedians Hampton Yount and Baron Vaughn are handling Crow and Tom duties, respectively, and will be joining Jonah Ray, Felicia Day, and Patton Oswalt in the revamped show. So enjoy watching the new ’bots navigate the intricacies of the casting process while attempting to join the illustrious pantheon of other Star Wars robotic actors like C-3PO, IG-88, and whatever that weird interrogation sphere thing was in A New Hope.